Mace loves the sport of Turbo Racing, where vehicles morph into a car, plane, or submarine, and every week plays an arcade game that simulates the race, since he is too young to compete in the sport. Mace can only dream about becoming a Turbonaut, but knows that it will never happen due to his family’s financial situation, until one day a retired Turbonaut named Tempest comes into his life. Tempest dreams of renovating Turbo Racing and plans to use a tween to accomplish her goal since youngsters are willing to take risks. Mace must compete against three other tweens in order to secure the spot as a competitor in the Prix, the biggest race in Turbo Racing. All seems to be going well until Mace notices that Tempest is encouraging the tweens to cheat and use dirty tricks in races. Mace wants to participate in the Prix, but when cheating almost costs his friend’s life, Mace must decide what is most important— being a winning cheater or an honest loser. I was captivated by this book the moment I picked it up. The author does an excellent job making a racing sport interesting to the reader while also moving the plot along. 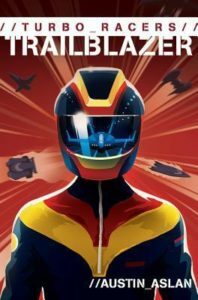 Trailblazer is the first book in the series but it is an excellent stand alone book.